Thickness 12, 15, 19 and 25 microns. We are offering of Shrink Wrap Films. PVC Shrink Wrap Film is supplied centre folded and is mainly used in conjunction with manually operated 'L' sealers giving a glossy, clear, tamper proof finish. PVC is available in 40% by 40% balanced shrink ratio and at various other shrink rates depending on the application. Most common thicknesses are 17, 19 and 25 micron, although 38 micron is also available. 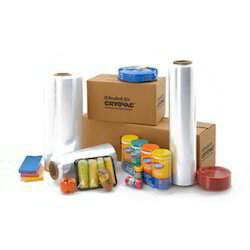 Looking for Shrink Wrap Films ?